We’d love your help. Let us know what’s wrong with this preview of Blatantly Blythe by Sarah Hegger. Return to Ghost Falls, where love comes to stay, for the long awaited third book in the series. Eric Evans is about to discover that you don’t know you love someone until you lose them, when town “bad girl” Blythe Barrows ends their long-term, on-again, off-again, friends with benefits relationship. 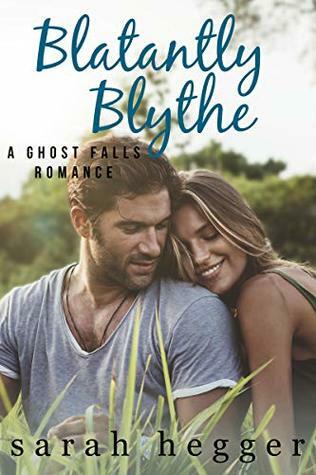 Having finally gained independence from the disreputable Barrows family, B Return to Ghost Falls, where love comes to stay, for the long awaited third book in the series. Having finally gained independence from the disreputable Barrows family, Blythe wants more for herself. However commitment-phobic Eric never made any promises. To ask other readers questions about Blatantly Blythe, please sign up. I really enjoyed Blatantly Blythe by Sarah Hegger. I was captivated from beginning to end. I definitely recommend this book. Dang it! I’m finished now will have to wait for the next in the series. Just love Ghost Falls and it’s characters. Blythe is known as the towns bad girl. She was not lucky with the family she was given and her friends are nil to none except for Eric. In her mind she is not good enough for him so turning her back on him to make things better for her is the decision she is going to make. Little does she know life is not going to be so easy and she is going to meet many roadblocks. In the end though what is meant to be will be and maybe a few friends will be gained along the way. This is an emotional book that I Blythe is known as the towns bad girl. She was not lucky with the family she was given and her friends are nil to none except for Eric. In her mind she is not good enough for him so turning her back on him to make things better for her is the decision she is going to make. Little does she know life is not going to be so easy and she is going to meet many roadblocks. In the end though what is meant to be will be and maybe a few friends will be gained along the way. Sarah did it again!!!! Oh my goodness!! I was sucked in and couldn't stop! I love the Evans family. The Barrows family have come in and out of the other Ghost Falls books but this time you really get to see into their lives! We all must beg Sarah to give us sooo many more stories from Ghost Falls!!!! Blatantly Blythe is a top read of 2019! Born British and raised in South Africa, Sarah Hegger suffers from an incurable case of wanderlust. Her match? A hot Canadian engineer, whose marriage proposal she accepted six short weeks after they first met. Together they’ve made homes in seven different cities across three different continents (and back again once or twice). If only it made her multilingual, but the best she can manage is idio Born British and raised in South Africa, Sarah Hegger suffers from an incurable case of wanderlust. Her match? A hot Canadian engineer, whose marriage proposal she accepted six short weeks after they first met. Together they’ve made homes in seven different cities across three different continents (and back again once or twice). If only it made her multilingual, but the best she can manage is idiosyncratic English, fluent Afrikaans, conversant Russian, pigeon Portuguese, even worse Zulu and enough French to get herself into trouble.